Five years after bringing Vikings and dragons together, Hiccup (Jay Baruchel) and Toothless have begun a life of adventure; exploring the world around them and charting their discoveries. However, they soon uncover a destroyed fort, and find Eret (Kit Harington), a dragon trapper who tells Hiccup that the dragons will all soon be under his and his master's control. Hiccup's father (Gerard Butler) fears the worst for their land, and immediately tells Hiccup to stay at home, but when he disobeys his father and flies with Toothless to make peace, he realises that he is now part of a much larger scheme. How to Train Your Dragon is personally my favourite animated film. It was so refreshing to find a story told through animation so fearless and so determined, but still loaded with humour, emotion and beauty. 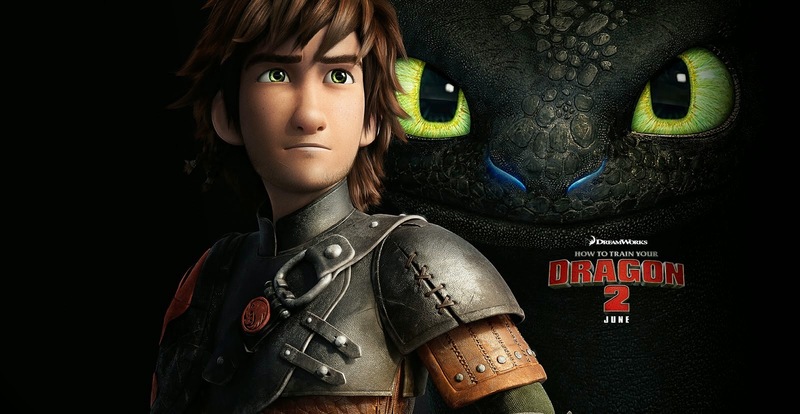 How to Train Your Dragon 2 just happens to match the original in just about every respect. In fact, I think it might even have topped it. Everything that worked the first time round feels just as fresh and exciting here, but this sequel feels so original in other respects, too. It's been four years since the original, and five years have passed for these characters. Everyone who saw the original in the cinema is now four years older, four years maturer. Which is why it's so great to see a film not only embrace that, but reflect upon it. This story is considerably darker than that of the predecessor's. What started as a nice light-hearted trilogy is here deepened, almost the entire final act of this film is dedicated to a battle the scale of which you might expect from Game of Thrones, not a DreamWorks animation. Towards the end of the second act, the film takes an especially dark turn, with a plot development that's likely to reduce younger fans to tears, and potentially some of the adults. It's pretty intense stuff, but it feels right. I appreciated the first film for going that little bit further in terms of pushing the boundaries of action-animations; this is on a whole new level. It's tense, it's frightening and, at points, it's pretty heavy stuff. But I wouldn't have it any other way. But, that isn't to say the film is all doom and gloom. Whilst it is undeniably more grown up than the original, it's still packed with that flare for comedy we saw first time around. The supporting cast have even less screen time here than they do in the original, but they're still consistently funny. Kristen Wiig's Ruffnut spends almost all of her screen time infatuated with Kit Harington's Eret, and there are great laughs to be found there. But that's what I also liked here, the characters have grown up. Ruffnut spends her time pining over the muscles of an older guy, and Hiccup and Astrid's relationship feels stronger and more assured. They've grown the characters up with the audience, but not lost hold on what made them so enjoyable. It's pretty spectacular, really. But, much like the original, this film's pride and joy lies with Toothless, who surely must go down as the greatest animated character ever made. Toothless resembles every pet you've ever loved, and with the loyalty to match it. He sustains the flight sequences (which are breathtakingly animated), he brings some of the biggest laughs, but he also plays a large role on the plot, here. And yet, director Dean DeBlois manages all of this out of one creature, who doesn't even get a place in the credits. Toothless is more expressive here than before, but they haven't gone too far with regards to the anthropomorphism of his character. He is an animal, and they play him out as an animal. Can I buy one on eBay yet? How to Train Your Dragon 2 is insane. Not only does it match the spectacle and the heart of the original, it actually improves on it. Right now, this is the front-runner for any Animated Feature award come award season, and I can't see anything else coming close. DeBlois stated in an interview before this film's release that he intended to make the Empire Strikes Back of the animation industry, and I truly believe he has. This film does what every sequel should do; it takes everything that worked the first time round, and develops it in appropriate way. The animation is stunning, the humour is there, and the emotion is just as powerful as you'd want it to be. And the icing on the cake? How to Train Your Dragon 3 is out in just two years. If that winds up as good as these first two installments, then please, don't stop there. To Summarise: Emotionally powerful, beautifully animated, well written and effortlessly telling the same themes and stories with a darker, more assured tone, How to Train Your Dragon 2 could well be the greatest animated sequel ever made.